Headed out to the swap meet with Mom to do some shopping and looking around before it gets to hot here in Arizona. Nice weather. Much better than the 60 degree weather we were having as a high with low in the high 30's. At my mom's home here in Mesa. Had a great day with her and now just settling in. We have a full day of activities planned for Sunday already. Should be fun. Ok, so I made it to the airport just fine. Everything is rebranded United here. Sitting out at the end of C84 which is clear out at the end. Lots of interesting flights leaving around me. A flight to LA. Other than that, I saw Aruba and Antigua at another gate. I am sitting across from my gate and this one goes to San Salvador. Matt drove me to the airport. He is going to take care of Smokey while I am away. She was happy that I fed her before I left. Ok, off to Phoenix for a week. Looking forward to a fun trip. Wow, as I get ready to jet my way across the country next week on my annual trip to see my mom. I realized that I have not updated this blog for a spell. So I am taking a break to bring this up to date with tidbits of worthless information that someone might feel is important. Or just someone who might be just reading this for fun. You never know. Lets see. Well had an interesting time on the Martha Washington bridge a few weeks back. That is the lower level of the George Washington bridge. I was in the center lane as this Jeep was in the left lane. Suddenly, her entire front axle breaks and her right front tire kicks out toward me and she hits the pavement kicking out sparks everywhere. I slowed to get behind her, hit the emergency lights and stop. She is really shaken up. There is another car there that was right behind her, he stops too. She did a great job of keeping the Jeep in the same lane and not loosing it. So here I am trying to call 911 and get help and direct traffic right after the approach. So it's a bit weird. The bridge is swaying as I am standing on it as cars zip past at 60 mph. I get a flare out and wave people over out of our lane. Drivers are real jerks at times. After about 15 minutes, the Port Authority Police arrive and take over. We had a nice Brush Fire in the Meadowlands. It started just 3.2 miles away from my work. The picture from my window is below on the left. It was a good sized one but they got the upper hand. 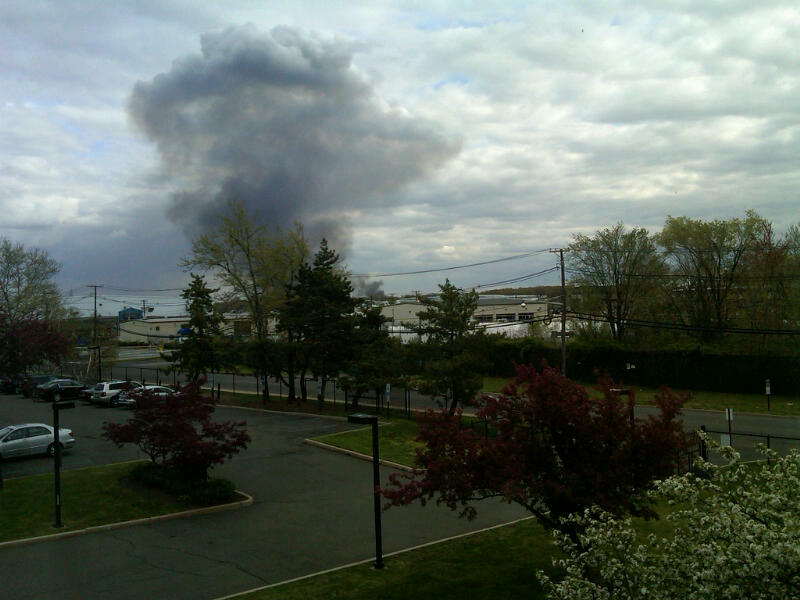 With this being Earth Day today, I should point out that the fire actually was good for the Meadowlands. It's natures way of clearing out the old growth brush and renew itself. The fire crews kept it in check to make sure it did not get to big and cause any damage to any structures. Not like the ones out in Long Island. The weather has been so dry and we were about 8" short of rain for the year. Everything was ready to burn. This weekends rain last night and today will really help us. We needed a good soaker. The building under construction above on the right is a new house being built in Cherry Grove this winter. It is so high, that we do not have a ladder in the fire department to reach it. Several new projects are adding height onto their places. Thus increasing the size of their homes but also the potential fire risk. Building laws are restrictive building out because of the National Seashore restrictions. But building up is not so difficult. I was out in Cherry Grove yesterday. Everything is really starting early out there. With the warm weather, lots of people have come back to The Grove early. Even the grocery store is open. I think it's one of the earliest opening for them in recent memory. I am having some difficulty with the Town of Brookhaven on getting my seasonal dock masters to start early because of the early start to the season. My contact with the Town is working on all of the red tape so I am hopeful everything will work out. This big rain storm today helped keep people away this weekend. So that really helped keep the numbers of people down on the dock. Anyway, time to get back to work. I have been just kicking back and typing for a bit now. Later. Oh, Smokey just jumped up here. Looks like she wants to say hi to everyone.